Just the ticket for those hot summer events. 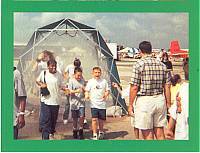 Innovative misting system that provides relief from the heat. Creates a cool, exhilarating and refreshed feeling to those heat weary participants. A MUST have for summer competition events! Also requires a water source and hose.